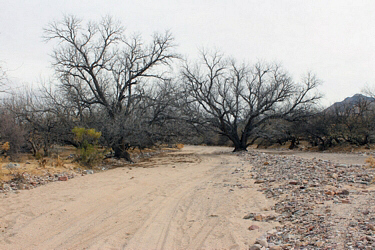 Prior to 1858, Tres Alamos Wash, north of the modern town of Benson in Cochise County, was part of a major east-west stagecoach/wagon route across southern Arizona. 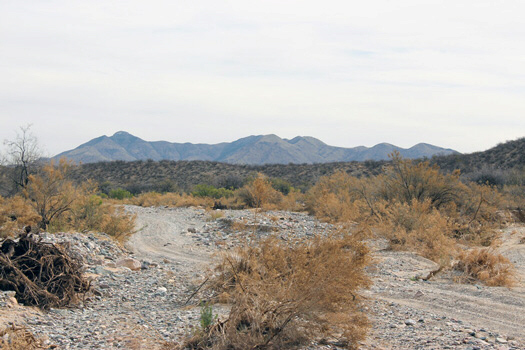 From the Wilcox Playa and Croton Springs, the old road ran through Nugent's Pass down Tres Alamos Wash to a crossing on the San Pedro River. 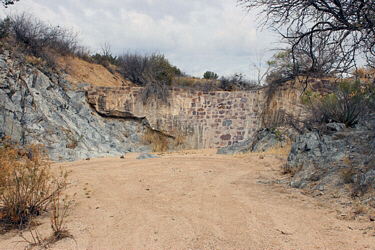 With the coming of the Butterfield Mail Company in 1858, the road through Tres Alamos Canyon was abandoned in favor of a more direct route to the San Pedro by the way of Dragoon Pass and Dragoon Wash. 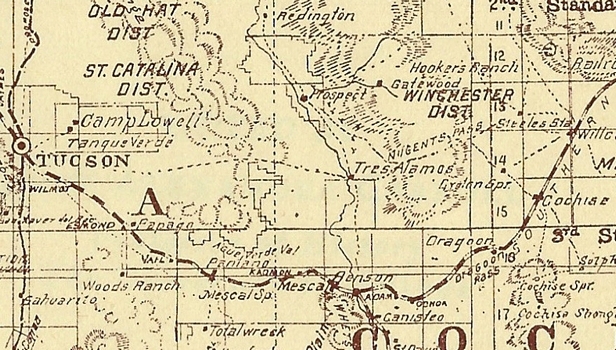 The old route was still shown on maps into the 1890's. Today, pretty much the full length of the Tres Alamos Wash section of the old roadway can still be driven. It is used by local ranchers, hunters and recreational riders. 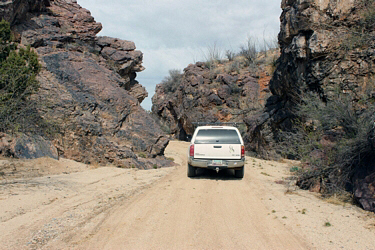 A good starting point for a drive up Tres Alamos Wash is the bridge over the wash on the Cascabel Road north of Pomerene. 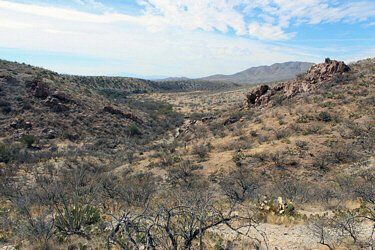 This is just a few miles from the San Pedro River. From the bridge, it is approximately 15 to 20 miles up the canyon to the area of Nugent's Pass near the head of the wash. 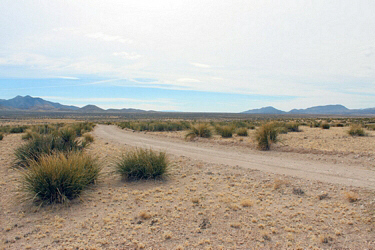 It is permissible at the upper end to cross the 3 Links Ranch to the county road leading into Wilcox. The trail down into the wash from the Cascabel Road is very rocky and rutted. A side view of the bridge will be seen if you look downstream to the west. 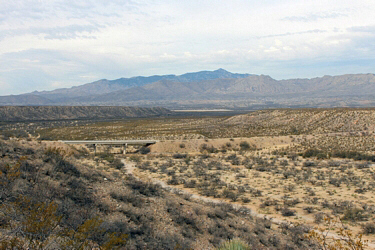 The San Pedro River is a couple of miles in that direction. 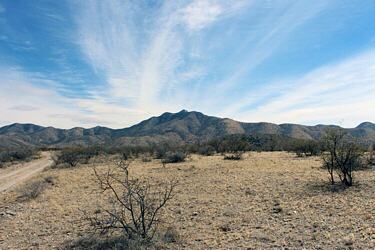 The mountains in the distance are the Rincon Mountains with Rincon Peak the tallest. The mountains in the distance to the east are the Little Dragoon Mountains. The tallest are the Mae West Peaks. I generally do not air down my tires when I get to rougher terrain, so it was necesary for me to shift into 4wd to handle the deep sand and gravel bars encountered in the wash. There were quite a few wire gates to deal with as we made our way up the canyon. Many large mesquite and willow trees were seen in the wash. There were very few "alamos" or cottonwood trees. There was no running water when we were there in February. The first homestead that we visited was up a side canyon to the left towards the Johnny Lyons Hills. The Forest Service map shows the land as private. There were no signs to indicate that visitors were not allowed. A look-up of the patent showed that a homestead patent was awarded in 1935 to Herman Thomas for a stock raising enterprise. The small one room building was constructed of railroad ties. The cabin had a concrete floor and the walls were plastered with a concrete mortar. Just upstream from the cabin were a windmill and a storage tank. A bit further up the wash was an old stone and concrete dam anchored by exposed bedrock. The dam was probably silted in many years ago. A roadway bypasses the old dam site and and then returns to the wash. For a first-time traveler coming down the wash from above the dam, it could be quite the surprise to suddenly come up to the drop off! The signature of the "Nogales Kid" adorns one corner of the dam. 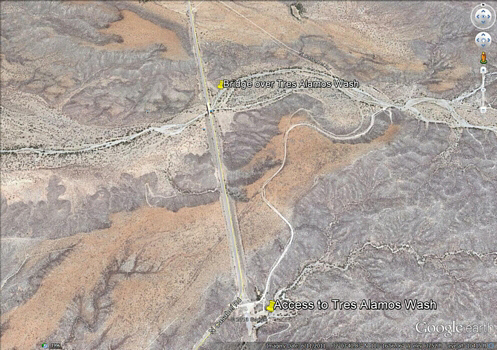 The second homestead was a mile or so east of Tres Alamos Wash on a road headed for the Little Dragoon Mountains. The old homestead building was tucked away near the bottom of a rocky drainage. Once again, the Forest Service map shows the area as private land, but there were no signs of any kind. A patent search showed that the 640 acres was awarded to Wayne Edward McNeil in 1934 as a stock raising operation. The old building's exterior walls were made of adobe. But the walls did not seem to be made of the smaller individual "bricks" that are more commonly seen. The interior of the old building has taken a beating. There were once wooden ceilings and wooden partitions to the individual rooms. There were two windmills near the old adobe building. The one in the photos below was the one in better condition. The mill was rotating in the wind, but there was no water being produced. On the drive out from the old adobe building, there was a nice view across to the west of the Johnny Lyons Hills. Rincon Peak was nicely framed in the center of the photo. 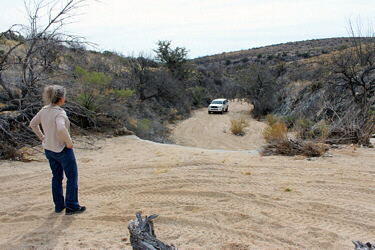 On the drive on up Tres Alamos Wash, there were several instances of erosion control that were seen on the smaller washes to the side. I do not know whose efforts produced these check dams. Could they have been CCC projects? The panoramic photos below were taken from the location identified by the USGS as "Nugents Pass". The co-ordinates are N32 11' 00" and W110 06' 00". My guess is that the views today would be very similar to the ones that would have been seen by the Emigrant Road travelers of the 1850's. The photo directly below is looking to the east at the pass between the Winchester Mountains on the left and the Steele Hills on the right. The photo below is toward the north of the Galiuro Mountains on the left and the Winchester Mountains on the right. 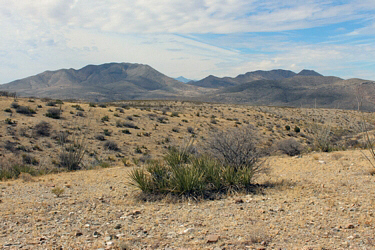 This view is towards the southwest with the Little Dragoon Mountains on the left and the Johnny Lyons Hills at right-center. 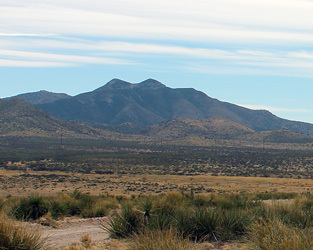 The Whetstone Mountains near Benson can be seen in the very far distance in the center of the photo. Could this modern road at Nugents Pass be located over the track of the original Emigrant Road? In 1980, the names of the two highest peaks in the Little Dragoon Mountains were changed. They officially became the "Mae West Peaks". The name "Lime Peak" that had previously been assigned to the tallest of the pair was re-assigned to another summit nearby. The view of the peaks below provides some indication of the geographers' inspiration.